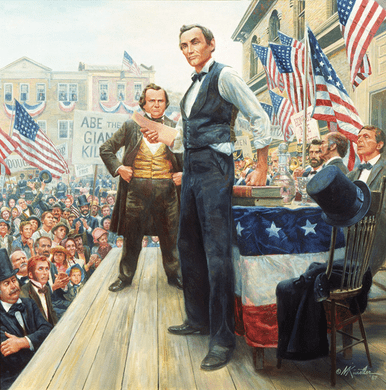 Mort Kunstler Handsigned and Numbered Limited Edition Giclee on Canvas:"The Lincoln-Douglas Debates"
About the Art: The indignation which Abraham Lincoln felt about the Dred Scott decision led him back to politics in 1857. In the legendary series of debates for the Senate seat from Illinois, Lincoln was pitted against Stephen A. Douglas, known as "the little giant" because of his prodigious speechmaking ability. Their first encounter took place at Ottawa on August 21, 1858. Lincoln, at 6 feet 4 inches, was more than a foot taller than Douglas. While the fiery, animated Douglas stirred his listeners, Lincoln spoke directly to the hearts and minds of the people with the voice of the common man. Although Douglas prevailed and won the election, Lincoln gained the national recognition that eventually led to the presidency.